Russian Nazi Leader Putin has ordered the Russian Army into the Ukraine in strength in the most serious European incident since Adolf Hitler. Putin has finally ordered the Russian Army to invade the Ukraine in force after months of feeding in Russian Special Forces and deliberately targeting a civilian airliner. This is not only a declaration of war on a sovereign neighbouring State, but it is effectively a declaration of war on all democracies. The turmoil in France and the useless lame duck US President have persuaded Putin that he can get away with a complete take over of the Ukraine. Putin may also have seen the situation in Syria and Iraq as distractions that will give him time to invade and hold the Ukraine. This is the most serious threat to world peace since the German Nazis in the 1930s. That the incredibly incompetent Lord High Eurocrat Crony Ashton and the EUSSR gave Putin the original encouragement to attack the Ukraine is no defence of the Russian Nazis. Russia is now a criminal State and should be treated as such. Putin is gaming on a lack of backbone in European leaders and the US President. NATO has now very few options. The rapid strengthening of its borders with Russia is already well underway and is likely to continue at an increased pace. The US is already for example refurbishing armoured fighting vehicles and returning them to reserve bases in Europe, readey to fly in troops to operate them. The dilemma is how to respond in the Ukraine. As NATO is a military organization it is ultimately under political control and that primarily means Britain, US and Canada but with all other members having a say in decisions. If any Russian troops “accidentally” stray into NATO territory a hot war will immediately break out and that is an automatic situation under the NATO agreements between members. NATO could also respond in support of a non-NATO Member if a request was made by that neighbouring country, but it would require a political decision by NATO Members. Putin is gambling that he will already control all of the Ukraine before that political decision is taken – assuming that the Ukraine’s Government makes a request for support against an aggressor. Putin is further gambling that once he has occupied the Ukraine no one will do anything to force him out. This is very dangerous territory because NATO has been close to full war status for weeks now, prepared to respond to direct Russian threats or to assist the Ukraine if a formal request for help is made and the NATO council agrees. What many may have overlooked, including Nazi Leader Putin, is that the NATO agreements also allow NATO to go into a neighbouring country where it is considered that the situation in that country is a threat to NATO. 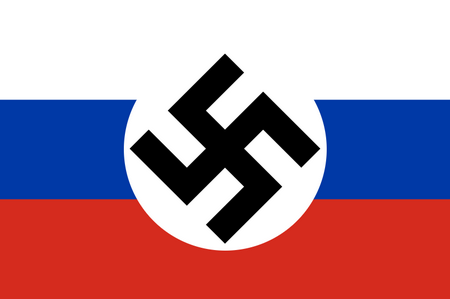 Clearly, a Russian Nazi occupation or intended occupation is a threat to NATO countries. In the long term, the sanctions already in place will serious damage Russia and there is scope for further sanctions that will have a more immediate effect. There is now justification for the US and Europe to evacuate citizens from Russia and close Embassies in Russia, with the ejection of Russian diplomatic staff from their embassies across Europe and North America. There is also justification to ban all Russian civil aircraft from North American and European airspace. That would be a very wise response to a terrorist State that has already deliberately targeted a civil airliner with the loss of all lives aboard. The real question now is whether NATO should go to war with the Russian invader. As in 1914 and 1939, democracies are very reluctant to go to war and hope for a peaceful solution but history shows that a Nazi like Putin will continue to invade his neighbours until they fight back and a major war develops.